Teacher assistants are also known as floaters, teacher aides, para-educators or instructional assistants. They provide valuable support to classroom teachers. If you are looking to be hired by an educational institution, you need to present a captivating Teacher Assistant resume that shows how well you can contribute to the realization of their school’s mission and vision. A Teacher Assistant plays an important role. He makes sure the primary Teacher is able to manage all the students in class. This includes assisting in teaching, preparing lesson plans, checking tests and making sure the students are well-behaved. This is not an easy job and can be very stressful. Many Teacher Assistants work long hours and miss lunch breaks in order to keep up with the pace at school. But it is an honorable job which helps mold young minds and develops productive members of society. The job of Teacher Assistant has stable demand because more children are enrolled in school every year. If you’re interested in becoming a Teacher Assistant, you need a resume that will catch the eye of the school. Our Teacher Assistant resume sample will educate you on how to structure your application. It will be as easy as A-B-C. Enthusiastic, passionate and well-experienced Teacher Assistant with great communication skills, loves children and dedicated to teaching seeks to build a career with a highly-respected educational institution committed to education and the development of fine, well-mannered and productive members of society. A dedicated Teacher Assistant with 6 years of classroom experience and strong desire to help instill the love for learning in children is looking forward to be a part of your growing institution. Willing to adjust schedule to fit your required working hours while pursuing a Bachelor’s Degree in Special Education. Maintains cleanliness of classroom and work areas. Teaches students who are preparing to enter the Big School or kindergarten. Supervises students in field trips. Monitors students’ performance and submits progress reports to lead teachers. Provides assistance to new students and their parents and assists in their orientation on schools’ regulations. Tutors students who have difficulty with Reading comprehension. Prepares various teaching aids such as charts, graphs and Power Point. Assigned to assist Grade 1 and 2 Teachers. Updated the students’ files and financial records of the Day Care Center. Helped maintained the cleanliness and sanitation of learning and play areas before, during and after class. Prepared materials needed for learning activities. Fostered strong relationships with students, parent and guardians to ensure their involvement in their children’s behavioral, psychological and emotional growth. Monitored daily attendance of children and was assigned to follow up with parents of absentees. Prepared minutes of the meeting held by lead teachers and parents. Have you ever seen how a group of 8 year old children interact with one another? Although the Teacher Assistant works in the background, he or she manages very important responsibilities and plays many key roles to ensure the effectiveness of the students’ education. Ask any primary Teacher and he or she will tell you a Teacher Assistant is a godsend! A Teacher Assistant has to be committed to the learning process. He or she must understand that learning is not just about having the necessary intellectual capacities. The word “process” itself connotes the value of time. You should be patient and dedicated to the process of learning. In your Teacher Assistant resume objective, you must draw attention to your strong personality traits that are important for educators. Children can be a handful and teachers and their assistants must have the disposition to oversee their development on a daily basis. You must show that you are passionate about education. You want to help the school take its curriculum to the next level. Share your purpose of wanting to make a difference in society by developing productive and well-mannered citizens. Some people may tell you that the resume objective is a waste of space. We’re sure they mean well but we want you to keep in mind that hiring managers spend only seconds scanning a resume. Most of their scan covers the top third of your resume where the resume objective can be found. Don’t take chances by not including a Teacher Assistant resume objective. Its purpose is to give you a section to state right away who you are, what you can do for the organization and why you want this job. From our Teacher Assistant resume example, you can see that Elizabeth starts off her resume objective with a soft skill: dedicated which is an important attribute for a teacher. You can use other attributes such as compassionate, caring and friendly but these should be associated with the teaching profession. Elizabeth then indicates her level of experience which at 6 years is good enough but may not entice employers who may prefer seasoned teacher assistants. So Elizabeth includes her purpose: “strong desire to help instill the love of learning in children”. Your purpose is always a powerful driver of interest because it can establish an alignment with the school’s own purpose and set of values. Finally, Elizabeth comes clean by informing the school of what to expect. She is currently trying to complete her Bachelor’s Degree in Special Education but is willing to make compromises to fit the schedule of the school. This statement shows the school Elizabeth’s desire to get the job. After reading this Teacher Assistant resume objective, wouldn’t you want to hire Elizabeth? It takes more than technical and fundamental expertise to become a good, credible Teacher Assistant. You must have the personality, attitude and disposition to carry out your duties on a daily basis. Educational Attainment; although many Teacher Assistants are able to find work with only a high school degree, having a college degree in a related course is a definite plus. If you are a high school graduate, make sure to provide the school a copy of your GED score. Certifications; it will also be a boost to your application if you can include certifications that are related to teaching. 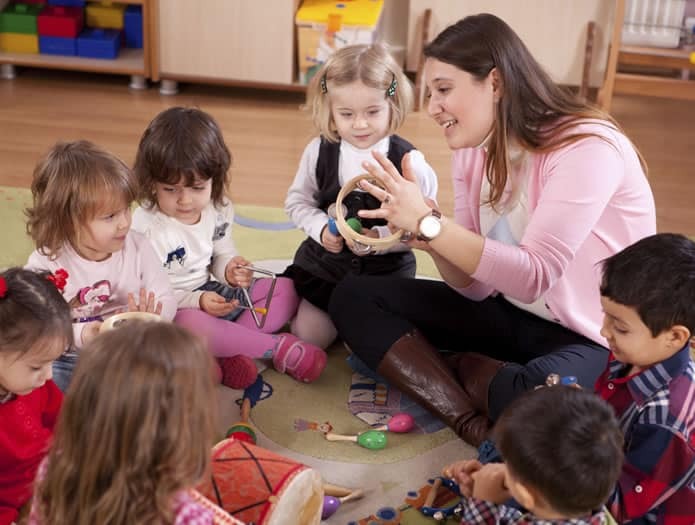 These could be courses on basic teaching or those that deal with child development. Patient; managing a roomful of kids can be very difficult. At their age, they are still developing mentally, physically and emotionally. Each child has a different personality from the other. This will require you to shift your approach to each child consistently. Ability to work in a stressful environment; you may handle as much as 4 classes every day. These are 4 sets of different students with their own unique set of behaviors. You will also deal with their parents. It will be very stressful! Highly organized; in addition to overseeing the children, you have to prepare lesson plans, distribute materials, check assignments and tests, tutor students individually and update records. Engaging; you will have to conduct lessons to the class from time-to-time. You should be able to draw full attention and encourage engagement with students to make classroom learning more effective. Keen attention to detail; children can be unpredictable. You have to be aware of where everyone is especially during field trips. Trained in First Aid; children are curious and sometimes these can lead to injuries. Having knowledge in First-Aid will always be a plus in a classroom setting. Excellent communication skills; successful instruction begins with how you relay the content. Students must be able to understand your message. Communication is also about being an excellent listener. Allow your students to comment if they have understood the lesson or not. Responsible and dependable; it is unavoidable, the primary teacher could be sick or unavailable because he or she has to attend to a meeting or important event. You have to be able to take over the class in the absence of the primary teacher. The Teacher Assistant is a valuable component in the teaching process. Teachers will have a difficult time carrying out their responsibilities without the help of a Teacher Assistant. Schools are looking for Teacher Assistant candidates who have had extensive experience in handling students and classrooms. This is a very stressful job and teachers need all the help they can get. In your Teacher Assistant resume experience, indicate in complete detail the scope of work and list of responsibilities you handled in the different schools you worked for. There are standard responsibilities that you are expected to handle and then there are tasks that could be specific to the curriculum prepared by the school. Although tenure should not be much of an issue when it comes to being a Teacher Assistant, it could be a disadvantage versus another candidate with more experience. In this case, you should focus more on highlighting your skills and list of responsibilities to draw attention to your qualifications. If you have experience teaching in a private capacity, include this in your resume. It further bolsters you ability to handle children. There is no need to include experience that has no relevance to teaching as these many only serve to distract the interviewer. By using our Teacher Assistant resume sample, you are certain to craft an application that will differentiate you from other candidates. You should also review the suggestions we made for resume objective, skills and experience as these could further strengthen your application. A Teacher Assistant’s job is a demanding endeavor. You really have to possess an innate love for children and teaching, to be able to work well. Your tasks will be divided between child care, instructional and clerical duties. There is a higher demand for instructional assistants at the early childhood level because the little ones require more care. Since the position is tied to children’s safety, wellbeing and learning growth, hiring managers are very careful in selecting applicants. In our Teacher Assistant resume template we made sure to highlight certifications of achievements and trainings that were acquired. Mention awards received from your previous and current employers too. Add other skills which are not related to your field but supplementary to administrative work. Teacher Assistants serve as teacher’s lookout and children’s older playmates. You have to be alert and physically fit especially when you are manning the classroom full of little children. When it comes to work experience, indicate all the tasks you handled. This will give hiring managers an idea how well your job assignments progressed over the years and prompt them to interview you. When you write your resume, think of how you can contribute to the school or center you are aiming to get hired. This way, you will be able to indicate the qualities that they want to see in the resume. Always check your State legislation for specific requirements for teacher assistants. Once you’ve confirmed that your requirements are complete then you can begin your job search. If not, take the time to complete them. Old School Leg Work – Visit your local schools and learning centers and personally find out if there are job openings for teacher assistants. Classified Ads – Check your local and national publications for ads posted by day care centers, private and public schools open to hiring Teacher Assistants. Online Job Search Engines – Visit popular online job board sites such as Monster, CareerBuilder, Indeed.com and SimplyHired. These online job platforms are also patronized by schools to look for teachers and teacher assistants. Associations – State and national associations of teacher assistants are venues for professional developments and networking. Ask for referrals from other members so you can be updated with job market opportunities. Social Media – Use social media to reach out to your former classmates, teachers or coworkers. Ask for referrals or inquire about job openings they may know. LinkedIn is a great platform to connect with those in the teaching profession. Join focus groups, engage in discussions or open a thread. Put networking into good use because it can open opportunities for you. Your resume will be the first point of contact with the Hiring Manager. It is very important to make a good impression right away. Refer to our Teacher Assistant resume and review our writing tips when you are preparing your own. Just like the children whose minds you are nurturing, your resume will always be a work in progress. Keep it updated and fresh to reflect the changes in your life, work experience and qualifications. If this Teacher Assistant resume example wasn’t sufficient for you, you are free to review some other samples and templates from our site. Browse to some related resumes below and find your inspiration.